mow this wire grass filled bed a couple of times for hay. These were once permanent beds which have been overtaken by wire grass aka devil grass (Cynodon dactylon, an uncultivated bermuda). 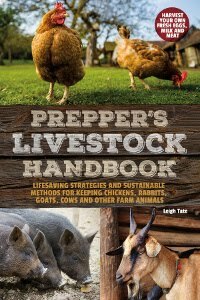 Long time readers will likely remember what I've done to battle this stuff: hand weeding, tilling, heavy mulch, cardboard, plastic solarization, landscape cloth with wood chip mulch, and more recently, pigs. The only thing I haven't tried is Round-up, which I understand is only a temporary solution, like all the others. Wiregrass growing through a thick straw mulch in the green beans patch. Last fall wire grass had taken over my permanent beds so densely that I couldn't plant a fall garden because I couldn't get to the soil. Talk about discouraged. That's when we sent in the pigs and goats and tilled once again. No, tilling is not the answer, but at least I can rake out enough of the wiregrass to plant something. In the beds where I have a tall, dense growth of something like flowers or other plants, the wire grass is considerably (albeit temporarily) abated. It's definitely a sun lover. The one drawback to my companion group planting is the different planting times and growing rates of the various companions in the group. Some things will be tall enough to mulch while others are barely breaking the ground. That delays mulching and gives unwanted weeds a foothold. The solution would seem to be to have everything about the same size when the bed is planted (or shortly thereafter) to get an earlier layer of mulch down. 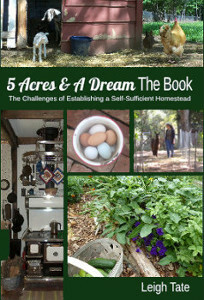 In Scott and Helen Nearing's The Good Life, I read how they kept their greenhouse so full of plants that anytime there was a vacant spot in the garden they had something at the ready to plant there. I can't help but think that a greenhouse is an answer for me. Of course, a greenhouse has been on the master plan for a long time, but like everything else must wait until there is time and money to build. We've got an idea for a new location for one, so I should really update the master plan one of these days. Even so, that won't help much with perennials like asparagus. So after getting only one side dish from it in four years, I'm calling it quits. I'm willing to work for our food, but when a thing takes time away from everything else, to me it isn't worth it. It's better to stick with the things that grow well in our garden, and asparagus isn't it. one drake and five ducks. I honestly never thought we'd have ducks. We figured we might get some if we ever got a pond, but without that it didn't seem like we'd be able to keep ducks happy. And a pond isn't on the horizon at present. 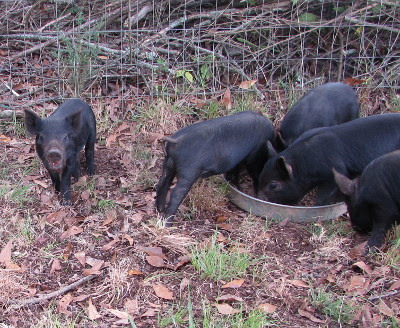 When I learned that Muscovies do not need water, are good foragers, quiet, and eat things like flies and black widow spiders, I gave the offer of trading some for one of Polly's piglets some serious consideration. They've been shy and hard to photograph. From what I read this breed is not considered a water bird but a tree bird. That they fly was a sticking point, considering what happened with our guinea fowl. We do not want any more birds that wander the neighborhood! But the gal who traded them told me that hers mostly stayed on the ground, so we agreed on the trade. Muscovies are a South American breed, said to be the only duck not descended from mallards. They are a meat duck, but are apparently quite prolific and lay good tasting eggs. Their meat is not greasy, but fine textured and considered more like top quality veal. They do not quack, rather, the males hiss and the females trill. So far ours have been shy and hard to get pictures of. We put them in the chicken coop, although the chickens don't seem thrilled with the arrangement. Under the circumstances it was the quickest thing to do, and we'll just have to see how adjustments work out. I planted late, but it was worth the wait. homemade goat cheese sandwich on homemade bread. Lunch doesn't get any better than this. I'm guessing that anyone who does home cheese making eventually tries their hand at ricotta. It's a soft cheese traditionally made from the whey leftover from making other cheeses. Modern recipes tell how to make it with the addition of milk or from whole milk, but I always liked the idea of using a waste product (well, not really, because there are so many uses for whey), to make something that stands on it's own. What is ricotta cheese? Unlike other cheeses, which consist primarily of the milk protein casein, ricotta is made from the albuminous protein in milk. Casein forms curds in the presence of rennet, whereas albuminous protein is not affected by rennet. Rather, it precipitates from the milk (or in this case whey) by heat. Hence the name from the Italian meaning to recook. I think I've got it down to about as simple as it gets. Simply put the drained whey into a clean pot and heat to 200° F (94° C). As it approaches this temperature, the albumin will separate from the water in the whey. Don't let it boil. Allow the pot to cool to room temperature. The whey will be a clear greenish-yellow color (from riboflavin, according to Dr. Fankhauser) with a cloud of ricotta grains floating near the bottom. Scoop out as much of the whey as possible, then gently pour the rest through a butter or unbleached muslin lined colander sitting on a pot or bowl to catch the remaining whey. You can skip the whey scooping part, but the ricotta particulates are so fine that they take longer to drain if some of the whey isn't removed first. Allow to drain. The cloth can be hung to facilitate draining. I like my ricotta soft rather than dry. Turn into a bowl or storage container. Salt if desired and keep in the fridge until ready to use. It's said to keep for about a week. Yield: Starting with a gallon of skimmed goats milk for the mozzarella, I average about 5 ounces of ricotta from the whey. I'm guessing the yield from cows milk would be about the same. That's it. No additional acid (vinegar or lemon juice) required. One of these is necessary for a fresh milk ricotta (or if additional milk has been added), but there is enough acidity in cheese whey to make ricotta without it. Dr. Fankhauser does recommend letting the whey sit overnight to increase it's acidity, but I've tried that and also tried making the ricotta immediately after I drain the whey from the cheese curds. I don't notice a significant difference in either taste or yield. It's easier for me to do it while I'm still in the kitchen messing with the mozzarella, so I do it then. left, but I still feed it to the pigs and chickens or use it for cooking. Now what? Cheesecake and lasagna, of course, but I've been experimenting and here's one of the recipes that we think is a 5-star keeper. Blend the ingredients using enough flour to make a soft, workable dough. Knead well. (My ricotta is fairly soft, so my dough is soft. I refrigerate half a day to make the dough easier to work with.) Roll into "ropes", about the thickness of your thumb. Cut into 1 inch pieces. Drop into gently boiling water. They will sink to the bottom for several minutes and then rise to float on the top. I usually let them simmer a few more minutes and then remove with a slotted spoon. Serve with your favorite sauce. They can also be made in soup broth as soup dumplings. My grandmother used to bake gnocchi in a cheese sauce like baked macaroni and cheese. 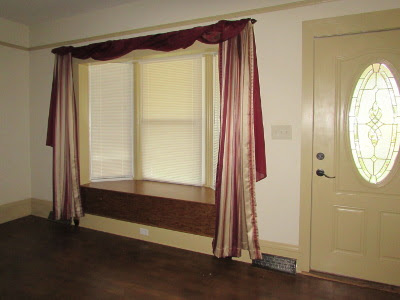 I've finished painting the window and door trim in the living room and can show you some photos at last. 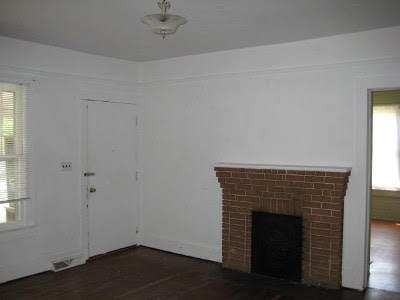 The before pictures were taken right after we bought the place. to our 1920s-built house and were very drafty. the new door, the room is both lighter & cooler (or warmer) than before. 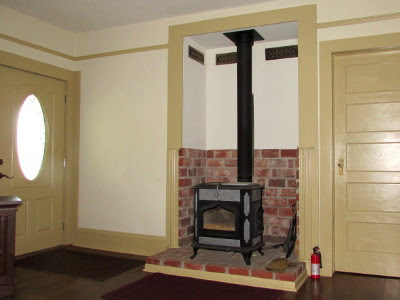 woodburning stove right after we moved in; the door was later. pipe & wants to hang something there. I'd rather have a chimney oven. I really happy with the improvements. 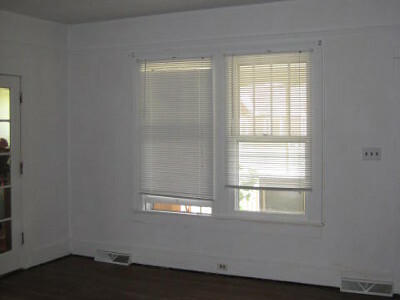 Even though we have the same floor space, the bay window gives the impression of making our small living room larger. It definitely gives more light, as does the new door. We still have to finish the rest of the front porch, but it's nice to have another room checked off the improvements list. For details and photos of the entire living room project, check out my Our Old House remodeling website. For the goats, one of the things I have learned is the importance of good quality hay. They are ruminants and this should be the primary staple of their diet. Also important are meeting nutritional requirements, especially protein and vitamins and minerals. Most of my concern and research has focused on that. For us, that means things I can grow and harvest pretty much year around, such as greens and root crops; also stored vegetables such as sweet potatoes and winter squashes. Greens and herbs can be dried and top dressed. Grains can be fed whole plant as hay. I can grow additional protein as cow peas, flax seeds, or sunflower seeds and feed with pods, shells, and all. Something else that's important but not discussed much is energy. This is usually fed in the form of grain, but if you have read (or do read) those posts you'll understand why I feed only limited grain. Folks are usually concerned about protein and minerals (I am too) so most questions and discussions on the internet focus on these things. But I've been concerned about bulk (tummy filler) for the milking stand or times of year when forage is slim. These could be classified as energy foods and because goats are ruminants, should be largely cellulose based such as stalks (corn, sorghum, and/or amaranth) and corn cobs. No, that's not as terrible as it sounds because they use things like this in pelleted animal feeds, although on feed bags you'll see them listed as plant products and roughage products. What we've needed is a way to process these items into a size the goats can manage. We've discussed this a lot and can finally show you our first experiment in DIY goat feed! We bought the Yard Machine about six years ago. As a chipper / shredder it was pretty disappointing, because it scattered pulverized mulch all over the place, like way across the yard. As a piece of junk to clutter up the carport it did great, and we often pondered what to do with it. We would crank it up every now and then, but it could only handle small sticks and leaves so it was only semi-useful. We usually end up renting one of these once a year to take care of our huge stick and branch piles and make wood chip mulch. With PVC pipe, rain gutter parts, duct tape, and a 30 gallon lidded drum, we've got the beginnings of a feed chopper. Not as consistent as we hoped but not bad for a start. Chopped and shredded corn cobs and amaranth stalks. What did the goats think? Read on. I took a couple handfuls of the finer stuff and mixed it in with the evening feed ration for the girls at milking time. Daphne ate it all and Helen left only the largest chunks of corn cob. I'd call that the beginnings of success. My plan is to eventually mix this with dried and fresh herbs, greens, cowpeas, amaranth grain, and produce to make up the ration. To check nutritional content, I will have the mix tested by our cooperative extension office. The stalks were still somewhat green and we think the chopper may do a better job once they are completely dry. That means more experimenting later on. In the meantime, Dan is thinking of ways to tweak it, while I'm just happy for a big step forward in our quest for self-sufficiency. Yesterday I heard the neighbor's dog going nuts so I went out to check. I saw two of the piglets in the neighbor's yard! How in the world they find places to squeeze under the fence is beyond me, but we absolutely could not have Polly's piglets roaming the neighborhood. At five weeks old they are ready to wean so we rounded them up, and I posted an ad on Craigslist. We'll keep two for the freezer and sell four. Hopefully they'll find homes soon. Not too long ago I was given a wonderful gift of two different types of grain mills. The first is an electric Wonder Mill. Actually I've wanted one of these for a long time, but I have my Country Living manual grain mill and couldn't justify buying another, even though it takes 20 minutes to grind enough by hand for a loaf of bread. I have to admit that I sometimes feel pressed for time when it came to making flour. Worse, I would end up buying whole wheat flour to have on hand, just in case I didn't get any grain ground. The Wonder Mill is a wonderful time saver, plus, it makes beautiful whole grain flour including a fine corn meal. I'm delighted to have this mill as well as the manual back-up! The other mill is a Marga Mulino. It is a hand crank mill which can make flour, but it can also flake grains for cereal! That has been something else on my wish list. and one for finer than flakes from harder grains like oats. This means I can make my own fresh oatmeal and granola! For these I must express my most heartfelt thanks to Ashley for her generous gifts. They are a blessing indeed. I had a good radish harvest this spring. My favorite are Purple Plum radishes. They are good flavored and good keepers. We ate a lot of them in salads and the rest have kept well in the fridge. But I had enough extras that I thought I'd like to try lacto-fermenting some. My basic lacto-fermentation recipe is simple, although it's evolved somewhat. I use it with cabbage, turnips, and Jerusalem artichokes. Pound the prepared vegetable in a crock if you have one. Otherwise wide mouth canning jars will do. The idea is to pound out the natural juices, although I rarely seem to get a lot. To each quart of water add a quarter cup of whey and one tablespoon of salt. If whey isn't available, increase the salt to two tablespoons. I like using whey because I usually have plenty and we like the flavor of the finished product better. The contents must be submerged in liquid to prevent mold. I use a small plate weighed down with a half-pint canning jar partially filled with water. Cover with a cotton dishcloth to keep dust and bugs out. Let sit on a counter at room temperature for about three days. Now, "room temperature" is a bit tricky. There is no strict definition for it, but apparently 72° F (22° C) is a good temperature for fermentation. My kitchen is considerably warmer than that, so I find fermentation is much quicker than the typical three to four days. I know when it's done when it stops bubbling and has a healthy sour smell. At that point it's moved into the fridge and ready to eat! The radish skins imparted a pretty color. How did it pass the taste test? With flying colors! However, there was a PROBLEM I've not experienced before. For several days the fridge smelled like, well, I'd describe it as overpoweringly cabbagey, but Dan said it smelled like something had died in there. I cleaned the fridge out twice, scrubbed it down, but it still smelled. I finally figured out it was those radishes that were causing the problem. I've never had cabbage or turnips smell like that! It wasn't spoiled and was tasty, but for some reason those lacto-fermented radishes had an unacceptable odor. I resolved that by putting them in a sealed tupperware container. Problem solved. Would I recommend this recipe? Well, we enjoyed it tremendously but because of the odor I'll have to advise you to try it at your own olfactory risk! This has not been a good year for the garden. No rain in May, June was rainy but too hot, July was less hot but too dry; I'm amazed I have anything growing at all. But I do and am thankful for it. 1st tomatoes are always exciting news. These are from a volunteer plant. to fry the first ones green. I plan to can some green tomatoes for that too. smaller ones are best sauteed, the larger make good stuffed squash. The cushaw is sharing a bed with the okra, also behind schedule. I'm harvesting multiplier onions. These are some of the largest. Multiplier onions do better for me than globe onions. Seed saving has begun too. from the pod if I have storage space. I just break the pods open as I plant. Now it's time to think about the fall garden! I'm never ready for that in August because it's always so hot. But it is the time to get those seeds in the ground. Is anyone ready for that?